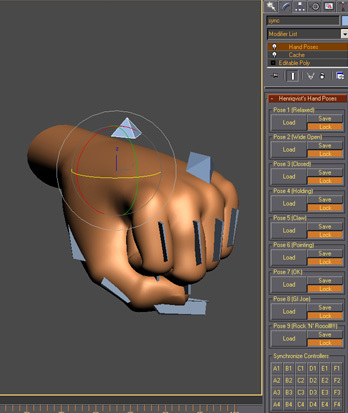 Script developed to enhance the speed of animating hands. You can save a lot of poses and then load it anytime you want. OBS1: It only saves position and rotation, scale information is not stored. OBS2: You cannot use position or rotation list in the controllers, but you can use float list. Select one hand controller and run the script. Now rename temporarily that main controller to "sync" and turn on the Pin Stack. Now you can select other hand controllers, and for each one, click in one of the 24 sync buttons available. If you open the Track View, Position and Rotation should become bold (Instance). After all the controller are synchronized, you can rename back your main controller. OBS3: Never rename the created modifiers. Now you can save up to 9 different poses, "Lock" prevents you from unwanted saving, unlock to save it again. OBS5: If you just want to store poses of only one object, you don't need to rename it to "sync", but you have to use the 'A1'. Don't know yet, if you find anything and know how to fix it, please e-mail me. Submitted by henriqvist on Thu, 2012-02-09 04:30. Submitted by LuisGomez on Thu, 2012-02-09 01:21. Does it works under 3DSMax 2011?